Ideas include more segregated cycle lanes, Low Emission Zones and pedestrianisation of key areas. What kind of cities do we want to live in? In recent weeks, there has been a few promising developments in Glasgow and Edinburgh that could point towards healthier, happier futures for city dwellers. These ideas include more segregated cycle lanes, Low Emission Zone proposals and closing roads or sections of roads to traffic – a process known as ‘pedestrianisation’. Air pollution in Scotland, which causes 2,500 premature deaths every year, primarily comes from transport. Measures which encourage walking and cycling and discourage private car use reduce the number of vehicles on the roads. Less cars on the road means less emissions – cutting both air pollution and climate-changing carbon emissions. Increased walking and cycling has the added bonus of improving our health. The City Council have announced that George Street could be closed to cars. Edinburgh Council’s ‘Transformation’ plan includes monthly ‘Open Streets’ days on the first Sunday of every month. These are days when the city centre will be closed to all but emergency vehicles, allowing safety and security for pedestrians and cyclists, and creating temporary public space for events. 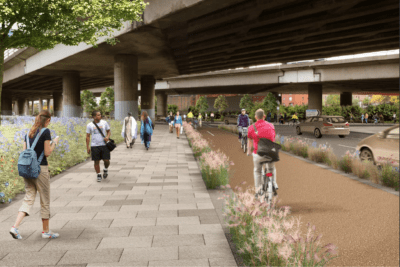 Glasgow City Council’s ‘Avenues’ project will add greenspace and segregated cycle lanes along many of the arterial routes in the city centre. The council also recently announced plans for two city centre streets to be closed to private cars, but remain open to buses. These ‘bus gates’, as they are known, will help reduce traffic congestion for buses, improving journey times and the bus passenger experience. It is essential that as try to reduce our reliance on cars, we improve our public transport and these bus gates are a small piece of that puzzle. Glasgow Avenues project artist’s impression. Transport for London recently published research on what an increase in walking and cycling can do for your high street. This includes a decline in empty shops and an uptick in rental value of shops. They found that cyclists spend 40% more in London’s shops than motorists. There is a wealth of evidence showing that areas where space for cars has given way to space for cyclists, business has gone up. Calling for more cycling in Edinburgh. Crucially, these economic benefits do not even include the cost savings made by being a more active population. Less air pollution and more physical activity would have huge benefits for any city, and have associated cost savings for healthcare. Research into Mini-Holland schemes in outer London shows more people walking and cycling. By creating cities that put people first, ensuring space and safety for pedestrians more car owners will choose to leave their vehicles behind. Journeys will become quicker and easier when using public transport, or under their own power by walking or cycling to their destination. Around the world, cities are realising the benefits of prioritising walking, cycling, and public transport. The Mayor of Paris recently announced plans to close the entire city centre to cars. Oslo, Madrid, and Brussels are already there. 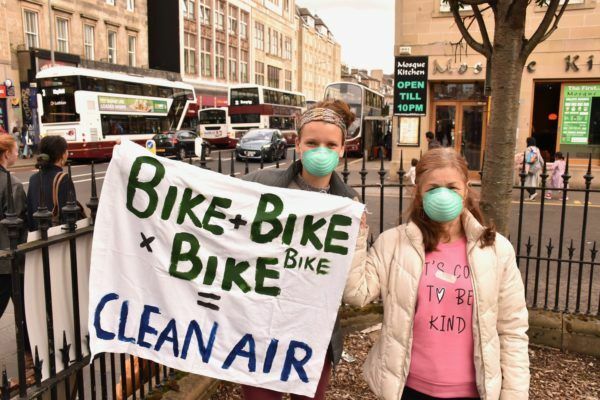 Whilst Scotland’s cities are still a long way behind their European counterparts, the recent proposals should be welcomed by anyone who wants to improve our air quality. First of all, never assume that a good idea will ever see the light of day. We need to keep pushing for progress until we see actual change on the ground. So make sure you respond to the consultation and answer the surveys (collected below). Talk to people you know about these ideas, why you think they are important, and how our biggest cities will benefit from making people the priority rather than vehicles. If you’d like your town or city to explore ideas like this, email your local councillors. Ask them what is happening to reduce air pollution from traffic locally. Do let us know if you hear anything back. Glasgow, bus gates on Union Street and Oswald Street.